The Minion DHF profile is seen here with a 40mm internal rim. 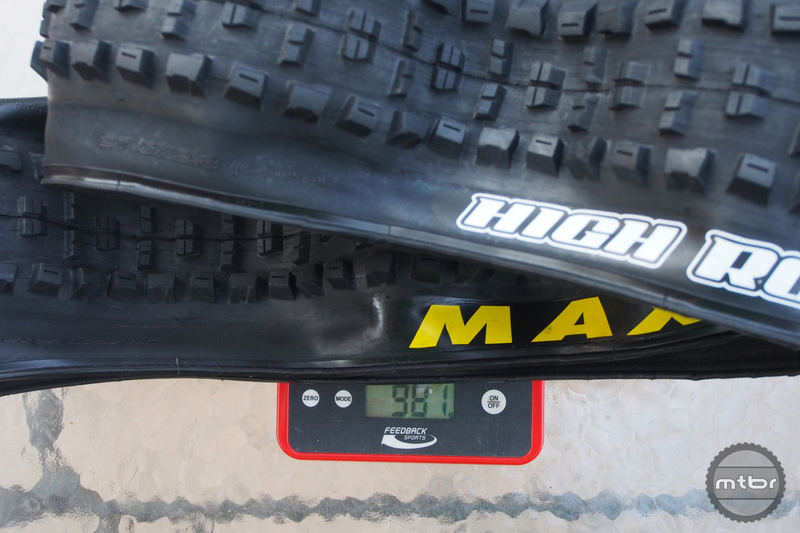 We’ve been riding our Maxxis 2.8 Minion DHR/DHF II’s and HighRoller II’s now and could not be more pleased. Traction has been unbelievable and they’ve been durable as well with zero flats and cuts even after a couple trips to to the rocky descents of Downieville, CA. 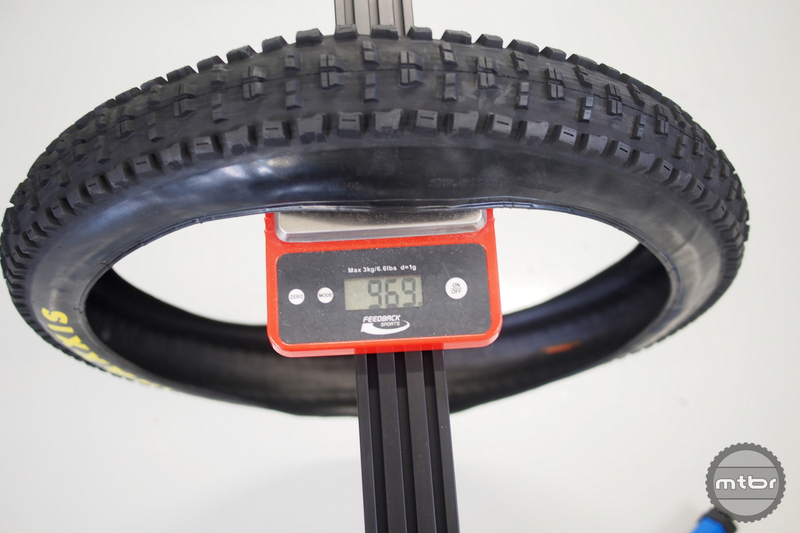 What is quite remarkable is the weight of these tires are all under 1000 grams! So agility and responsiveness is quite good. Couple that with a carbon rim and it has very little downside. 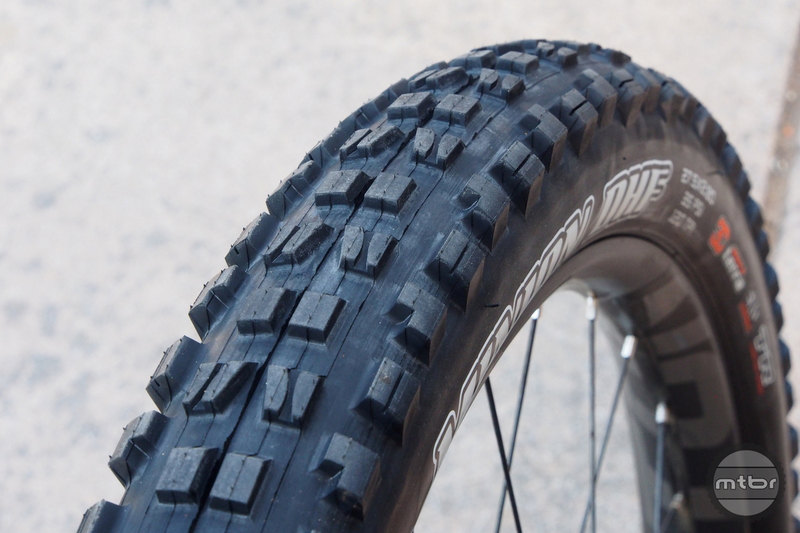 Of course these are not XC or endurance racing tires but compared to 2.3 Minions and High Rollers, they really offer a viable option with different core strengths and big sweet spots. The heights of the knobs are shorter which is not just driven by weight concerns. On a Plus tire, there are more knobs in contact with the ground so the knobs don’t have to be as tall. Also, the casing is a key part of the system as pressures under 20 psi are the norm. We regularly played with 14 psi and the vicinity pressures to open up the advantage of the these tires, achieving traction with the knobs and the casing. 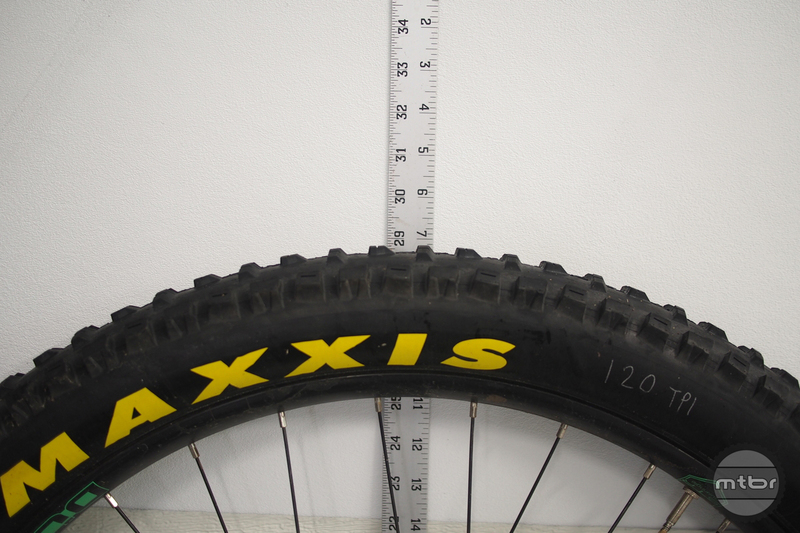 The Maxxis MInion 27.5×2.8 is seen here with the 29×2.3 on the right. The Minion 29×2.3 measures 57mm at the widest casing width. 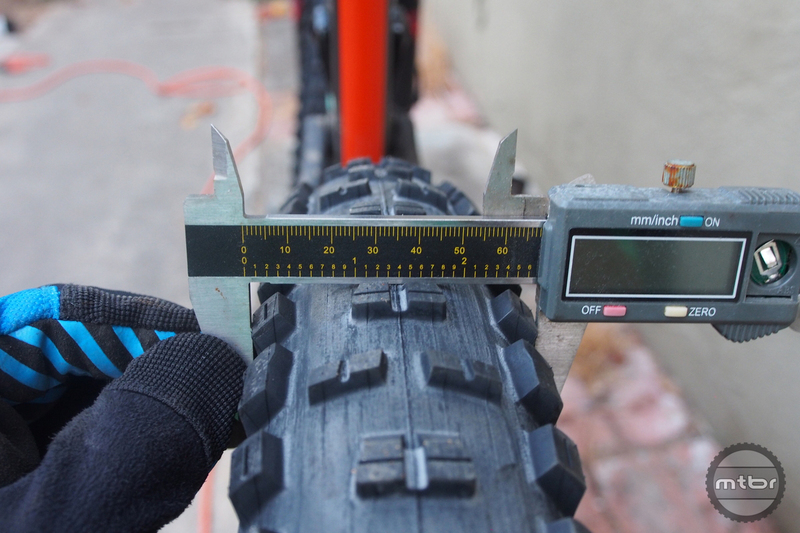 Width for the 27.5×2.8 is 67mm. 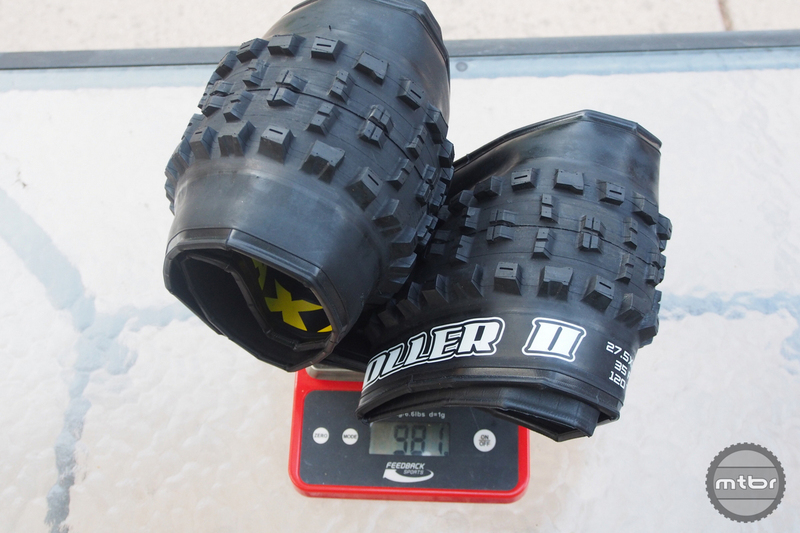 Minion DHR (rear specific) 27.5×2.8 weight is 987 grams for the second set. The HighRoller II is an interesting beast. It’s not quite as gnarly and knobby as the Minion. So what is it for? With a more open tread design, we found great use for it with its climbing and braking traction. It seemed to dig in quite well and claw its way up steep climbs. On heavy braking situations, the open tire was able to get good, consistent braking bite. 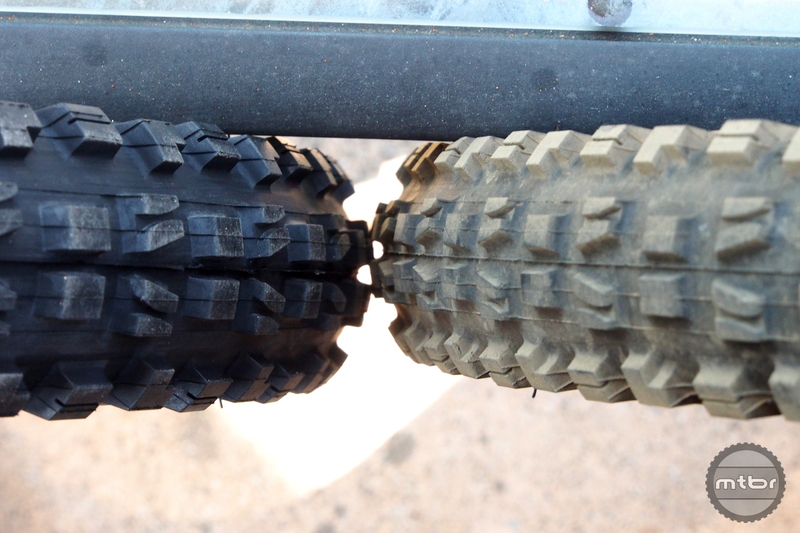 Also, in wet and muddy conditions, these tires performed quite well. Not known as the forte of Plus tires, a big reason is many of the Plus tires in use today have very small, short knobs. The casing doesn’t really bite well in mud so big knobs are needed. We pumped up the tires an extra 3-5psi and had a better experience in the mud than previous Plus tire efforts . Highroller II 27.5×2.3 width is 68mm. 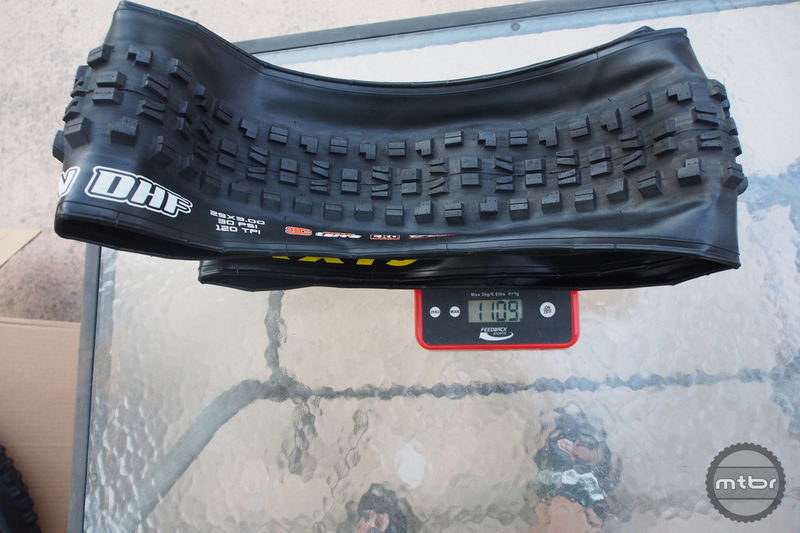 The new tire of the bunch is the HighRoller II in 3.0 size? Why you ask? Well, it is the logical next step for someone who is extremely happy with the 2.8s but seek more girth and cushioning. More floatation is available too on sand and snow conditions. 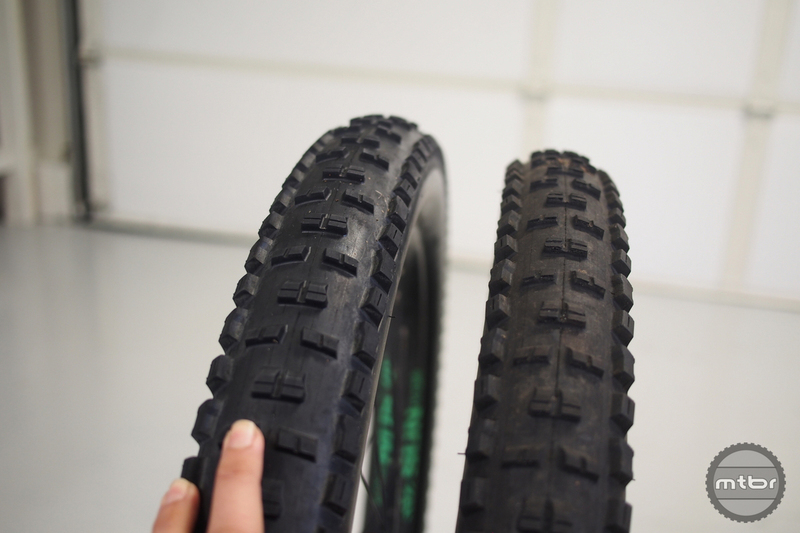 Also, with the advent of large 2.5 and 2.6 tires specifically designed for wide rims, the 3.0 is a way to truly separate from that crowd and offer a riding advantage. Of course the big fear is weight but these 3.0s are a shocker with their 969 gram weight. This is made possible with 120 TPI and nearly flawless, consistent manufacturing. These are media samples so weights are preliminary but it displays what Maxxis is capable of. The height of the tires is interesting. They really are quite tall and they get the Plus tire closer to the 29 inch tire height at 28.75 inches. 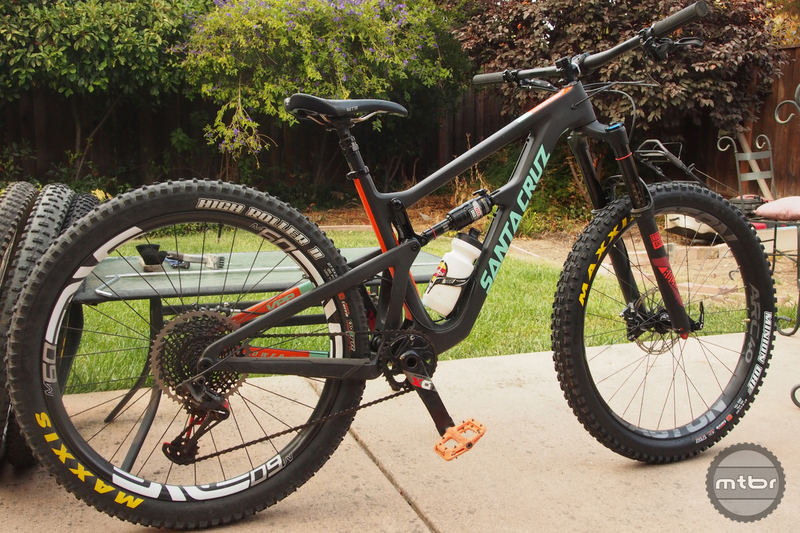 This is a great option for bikes that are a little bit too low in Plus mode since 2.8 tires are quite a bit shorter than 29er tires at about 28.1 inches. The 2.8s are available today and the HighRoller 3.0s should be available shortly. A 29×3.0 HighRoller is available as well. 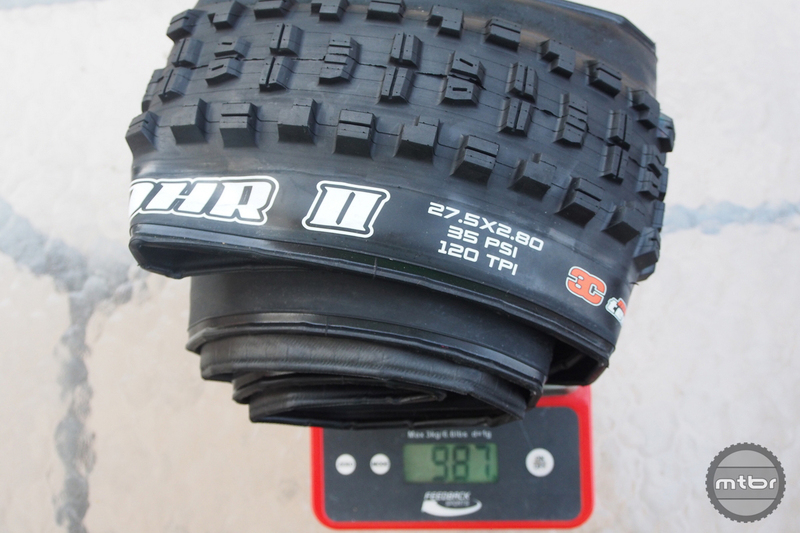 Minion DHR 27.5×2.8 weight is 987 grams for the second set. I have a 2017 Pike boost 27,5 (non plus). I love my minion 2.5 wt and want to try a Maxxis Minion 2.8. Would it fit or to less free space for mud? Mike, I don’t know about the Minion but I am running a Maxxis Rekon 2.8 up front on a boost 27 Pike. There’s probably .25-.5″ between the tire and the fork. This is on 35mm rims. If you have narrower rims the tire should theoretically be taller. Been really happy with the Purgatory GRID 3.0’s, but am interested in trying some of those High Roller 3.0’s when they become available. What was the ID of the rim you were measuring the 2.8 Minion on? What size ID did you measure the 2.3 DHF’s on? 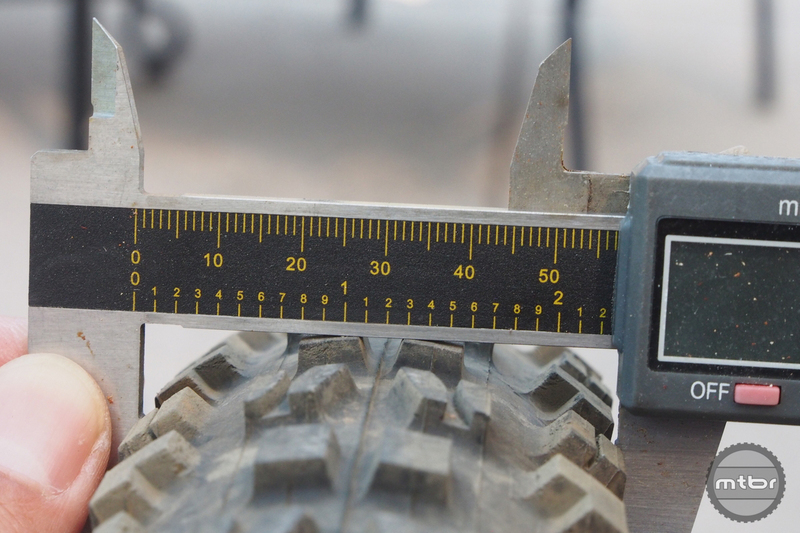 Yes, as other’s mentioned already, inner rim width is required for ‘apples-to-apples’ tire width measurement. 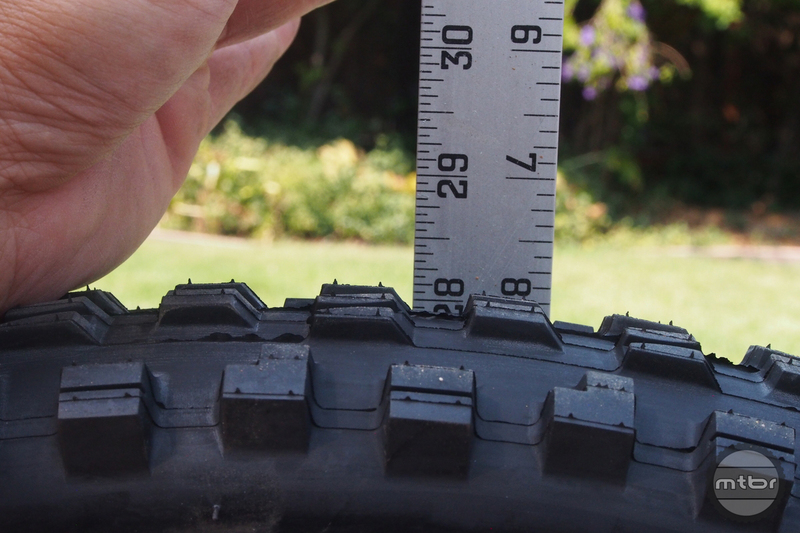 Because: a tire’s sidewall profile width varies about 1/3 x (rim-width difference) for road tire sizes, to 1/2 x (rim-width difference) for mountain tire sizes. 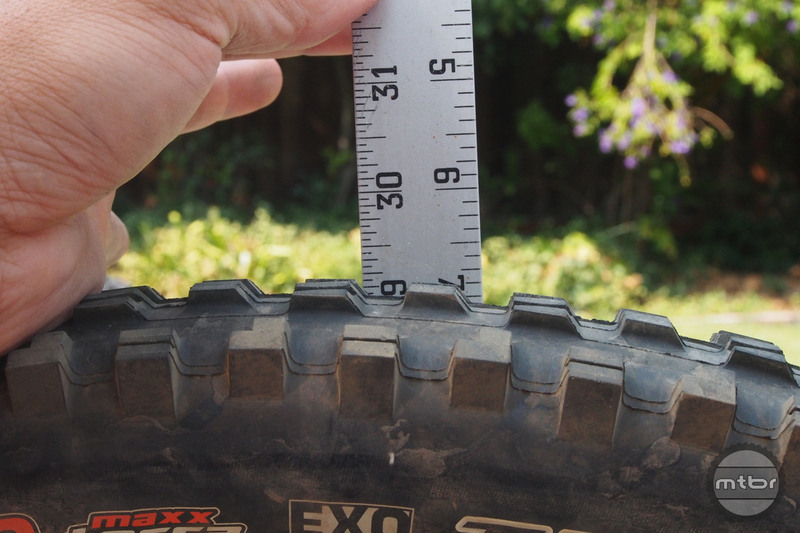 Additional notes: Unless a tread wraps far down the sidewalls, such as some plus-sized and fat tires, a given tire’s tread width has minimal, nearly measurable width change for rim-width differences, and is an inverse in width difference to rim-with difference. 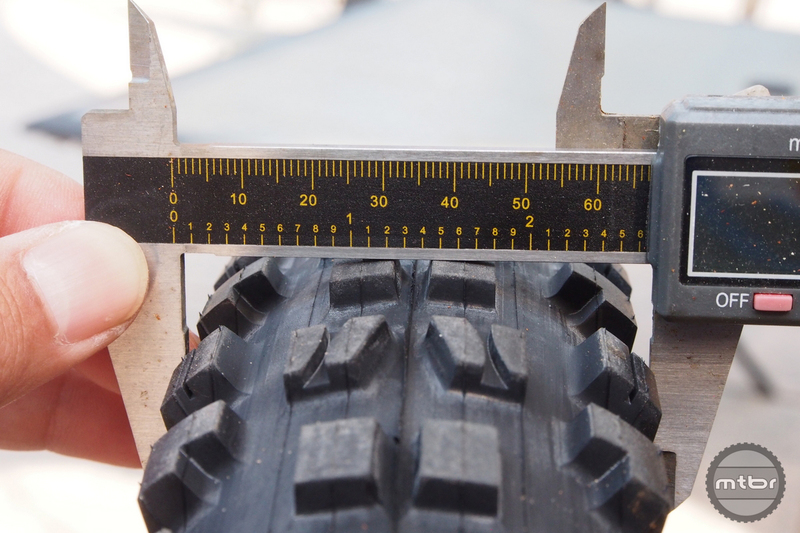 Also, a given tire’s diameter difference have nearly un-measurable diameter difference to rim width difference, unless more than about 1 inch in rim width change. Maybe optical perspective in the photos, but it appears the casing widths were measured, rather than the wider tread knobs. 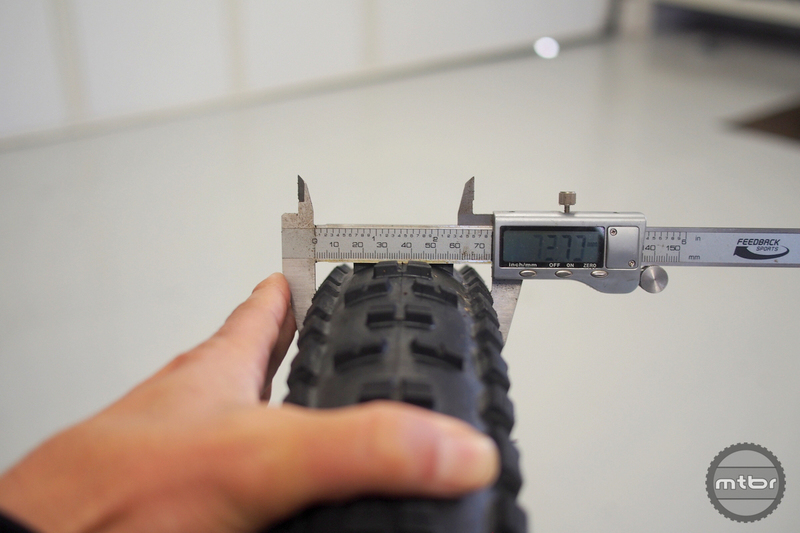 For practical stay and fork leg clearance considerations of tire measurements, tire widths should be measured by the widest cross section of the tire profile, whether tread or sidewall, whichever is wider, to accurately calculate clearance differences to stays and fork legs. Stop by and say “Hi!” at the Derby Rims booth at the following bike expos this spring: Sedona, NAHBS, Hurricane, Outerbike, and Sea Otter Classic. More events later are TBD.